If Visual Voicemail setup was declined during Initial Activation, navigate: Phone > Menu icon (upper-right) > Settings > Voicemail then tap the Visual Voicemail switch para activar. Solo Basic Voicemail is available for devices active on prepaid plans. Abrir Buzón de Voz Visual. 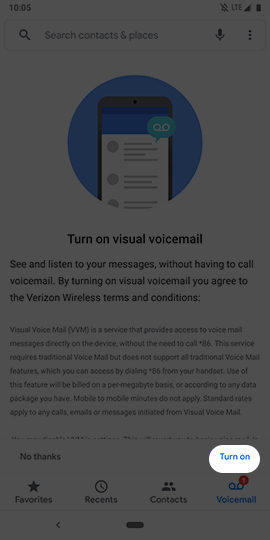 To continue, review the Terms and Conditions and then tap Turn on (lower-right) to be brought to the Visual Voicemail home screen.